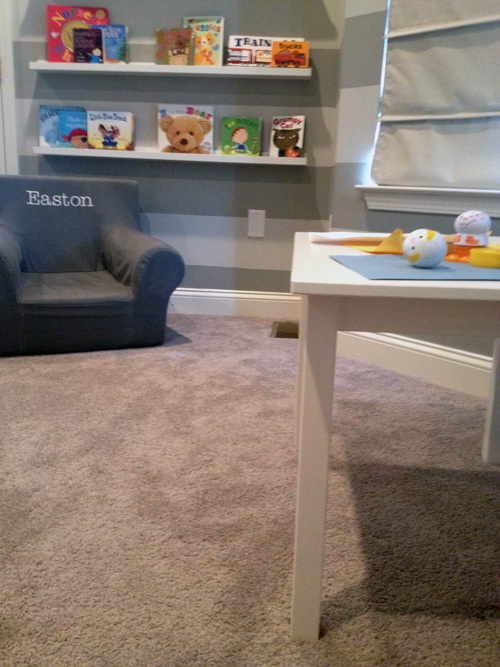 A while back, I posted about wanting to add some book storage to the playroom. I mentioned possibly building some ledges since it seemed fairly simple. Well, after a trip to Ikea a few months ago, we realized that we could use their picture ledges for a cheap and fast solution. 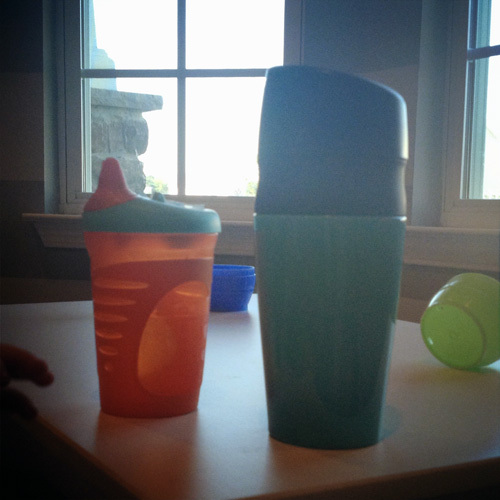 Since my goal in life these days is to keep it simple, we decided to buy them. 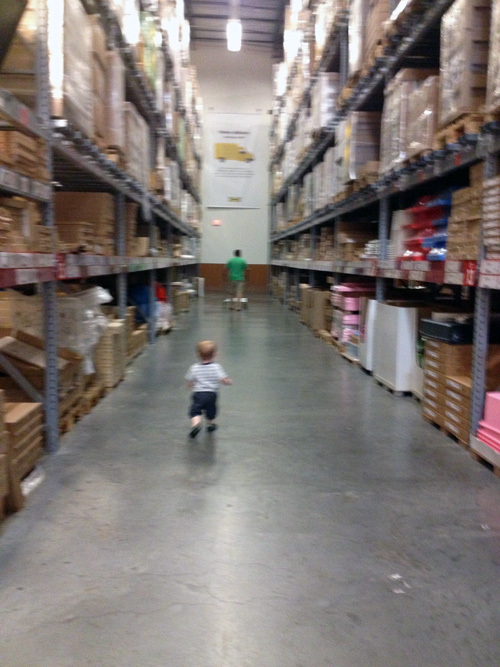 First, let’s talk about Easton’s love of Ikea. If you follow me on Instagram (@lilhousecould), you are already aware. We went (again) over the 4th of July weekend, so the store was empty. Since he’s currently a full out toddler, he had enough of the stroller at the end and just wanted to run. A giant, empty warehouse was the perfect place for all of his energy. We picked up 3 of the Ribba ledges in white, in the longer length (45 1/4″). We hung them while we were together one weekend during a nap. 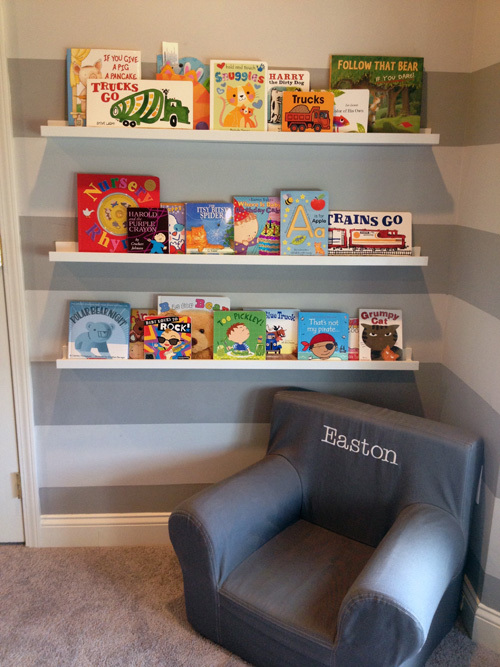 We used the stripes as spacing and decided to hang a shelf every stripe and a half to make sure Easton has space for taller books as he gets older. 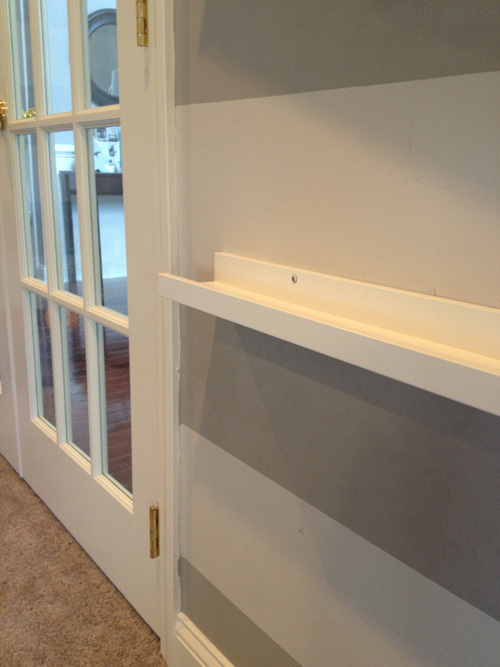 The stripes are 12 inches wide so the shelves are 18 inches apart from the actual flat part the books sit on. As Mike put it, it’s such a great use of space. Easton has a lot of books (he still has some in the family room and his bookcase full in his room) and this saved us precious space in his toy storage. Plus the colorful books “make it look like real playroom” according to Mike. 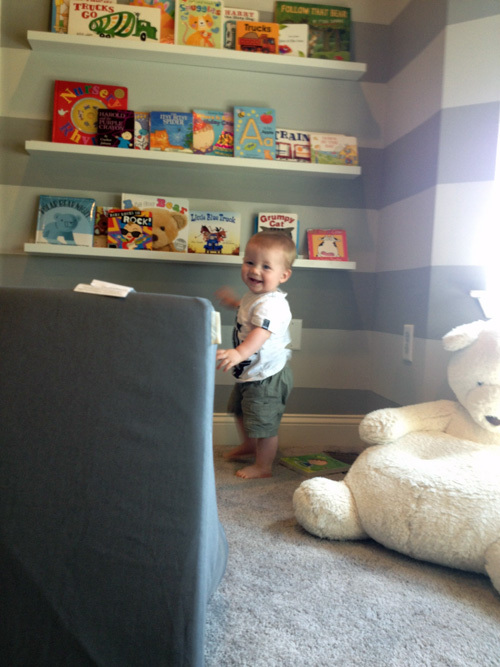 When Easton woke up from his nap, he ran over to his new book wall right away. 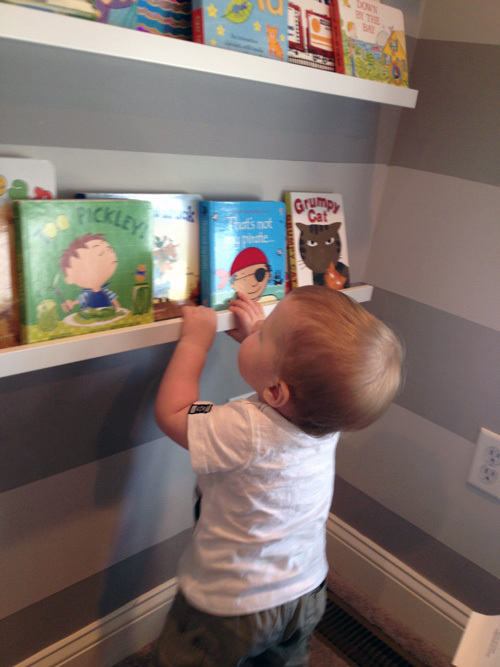 Baby bookworm. One day I’ll have to take a picture of him rearranging the furniture in our family room. I’m talking full out chairs and ottomans moving across the room. 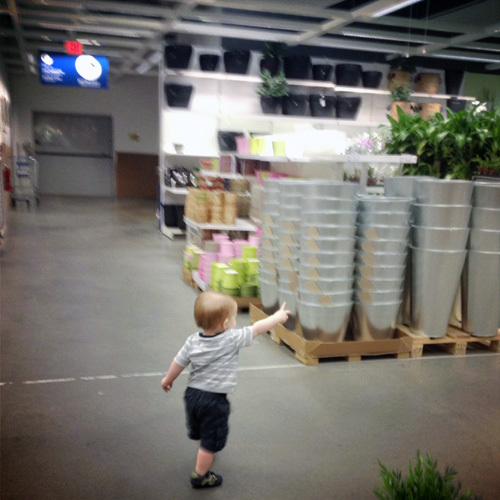 He says he just has an eye for these things…. 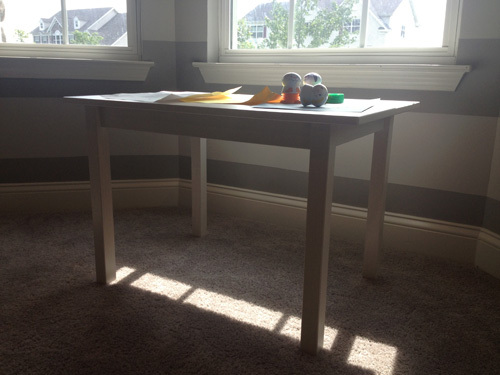 We went with the Sundvik children’s table in white. It’s solid wood, which was something I really wanted and it is the perfect size. We picked up 2 of the matching chairs to go with it, but for now they are still in their boxes. Easton wouldn’t be able to reach the table sitting and would definitely use them to Spider Man himself up on the windows..or the book ledges… or my head. In a couple of months they will be perfect and I might even paint them a bright color, we’ll see. 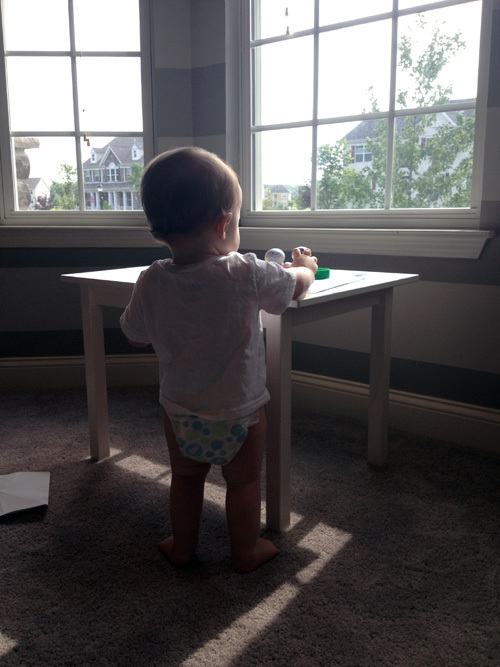 For now, the table is perfect for Easton to stand at. He has a nice little section of the room furnished now. There’s still a lot I want to do in here and I know it will be never ending as his needs/skills are constantly evolving. I’ve been trying to bust out some arts and crafts, but he’s more fascinated by how the crayons fit into the little Crayola palm grip things we have. He has been a master stamper though, even if it means there are stamps on the new table. We’ll be testing the durability of that Ikea paint with the multiple wipe downs. 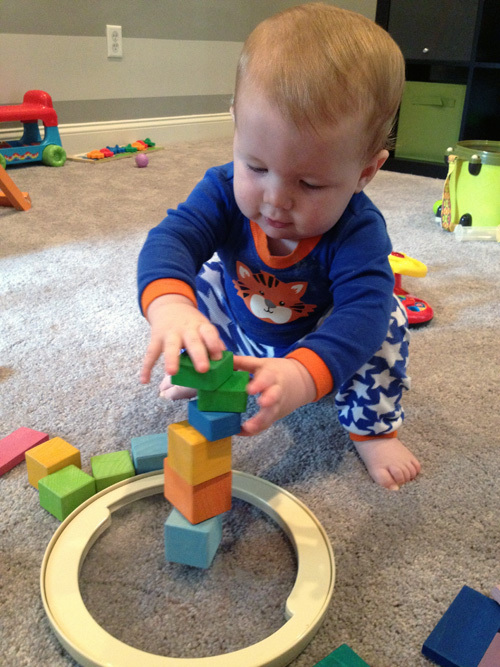 He uses the table for his blocks and stacking toys mostly, but also as a place to put his sippy cup. Wonder where he learned that one?